The Status of the World’s Soil Resources report has established that 40 per cent of Africa’s soils are severely degraded. A recent report published in Down To Earth points out that desertification has turned out to be a big challenge for Africa, seriously undermining its efforts in sustainable soil management. The continent suffers from soil erosion and low soil fertility which pose a threat to food production. By 2050, Africa will witness an enormous growth in population. According to the Food and Agriculture Organization (FAO) of the United Nations, more than a quarter of sub-Saharan Africa’s people are undernourished. Crop production will need to increase by 260 per cent by 2050 to feed the continent’s population. Better land management practice is one of the ways to fight climate change and increase resilience of farming systems in the continent. In a bid to boost soil fertility, the African Union (AU) Special Summit of the Heads of State and Government adopted the 12-point “Abuja Declaration on Fertilizer for the African Green Revolution.” in June 2006 in Abuja, Nigeria. The AU member states took a resolution to increase fertilizer use from 8.0 kg/hectare (ha) to 50 kg/ha by 2015, which marked the International Year of Soils. However, Africa failed to make much progress on the fertilization target. In the midst of it, there was the realisation that fertilization alone cannot improve the African soil productivity. The focus shifted to soil fertility management to ensure food security. The thrust is now on promotion of sustainable soil management as the approach for boosting healthy soils for a food-secure Africa. “Plants need nutrients to grow and every time a crop or plants are harvested, nutrients are removed… Therefore, it is essential to replenish the soil with nutrients to enable repeated plant growth. Nutrient replenishment or fertilizer use in Africa is generally very low, as stated in Boosting Africa’s Soils, so increasing fertilizer use will certainly help boost crop yields,” Ronald Vargas, soils and land management officer at FAO, said. According to the report, “The goal should not be to boldly increase the amount of fertilizer use, but to boost healthy soils as the main agenda item for many African countries.” Increasing fertilizer use should be done in a balanced, sustainable manner. It should be based on soil analyses which enable custom fertilizer recommendations to provide adequate levels of nutrients that are insufficient while simultaneously preventing over fertilization which can lead to soil degradation, pollution of water sources and wastage of money. “Increased fertilizer use should be supported by sustainable soil management practices which build healthy soils that are richer in organic matter, which in turn, would increase the nutrient and water-holding capacity of soils, as well as improve soil structure and aeration,” Vargas added. Agriculture is the backbone of the African economy accounting for approximately 20 per cent of the region’s gross domestic product. Despite considerable progress made on policy and investment to improve African agriculture, the continent as a whole remains food insecure. Africa is food insecure for several reasons which apply at various levels in the food value chain, of which food production is only the first step. Causes include drought and other extreme-weather events, pests, livestock diseases, military conflicts, corruption, political instability, dependence on cash crops and rapid population growth. “In terms of food production, Africa’s food insecurity is largely linked to reduced agricultural productivity caused by various forms of soil degradation. 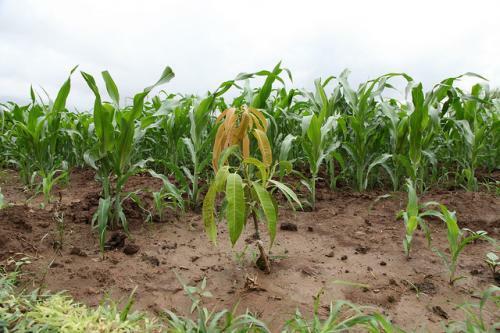 Some African soils have the problem of nutrient mining due to its natural conditions. However, another core issue is that of unsustainable soil management practices causing degradation, the most important of which are soil erosion, soil organic matter depletion, nutrient depletion and soil biodiversity loss,” Vargas told Down To Earth. Although the exact extent of degraded soils in Africa is not clear, it is estimated that 40 per cent of land in sub-Saharan Africa is affected by soil erosion by water, 38 per cent by soil erosion by wind (an estimated 22 per cent of agricultural lands is affected by soil erosion) and 12 per cent by chemical degradation. Food production (food security/insecurity) does not only depend on soil productivity. Food insecurity resulting from sub-optimal food production is caused by a complex interaction of the quality and inherent production potential of Africa’s soils, the status of soils (whether they are degraded or not and to what extent), water availability and quality, climate and extreme-weather conditions (floods and droughts). Soil erosion, a huge problem in Africa, is mainly caused by the exposure of the bare soil surface by inappropriate management practices such as cultivation, deforestation, overgrazing and drought. The Global Soil Partnership (GSP) was established in 2012 by the FAO to develop a strong interactive tie-up among stakeholders to increase sustainable soil management globally. The African Soil Partnership was established to support the implementation of GSP activities in sub-Saharan Africa in support of food security and climate change mitigation and adaptation. “Sustainable soil management and sustainable natural resource management in general would contribute to food security during the first phase of the food value chain by supporting actual food production (in terms of food quantity and quality),” Vargas added. Of the 17 sustainable development goals (SDG) and 169 targets, four contain targets related to soils and sustainable soil management. Target 2.4 of SDG 2 on Zero Hunger calls for governments to “ensure sustainable food production systems and implement resilient agricultural practices that increase productivity and production, that help maintain ecosystems, that strengthen capacity for adaptation to climate change, extreme weather, drought, flooding and other disasters and that progressively improve land and soil quality”. In present times, food loss and waste is a major challenge affecting food security worldwide. Roughly one third of food produced annually for human consumption is either being lost or wasted. In Africa, the annual amount of food lost can feed about 300 million people. In developing countries, about 40 per cent of food losses occur during post-harvest and processing; caused largely by financial, managerial and technical constraints in harvesting techniques as well as storage and cooling facilities. Crop diversification is one of the sustainable soil management practices that can improve soil fertility and soil health in general. “It will also help the whole agriculture system as it has many positive implications on the management of pests and diseases and the overall health of the ecosystem. Crop diversification improves food security and nutrition value of the family members…(and) could aid the economy of the household as it provides different opportunities,” Vargas said. Africa's greatest abundance of two natural resources water and sand soils can be coupled to feed it's rapidly growing human and animal populations. New irrigation technologies combined with soil water retention technologies (SWRT) have produced record yields of 20 MT per hectare of maize grain during a single crop. Beginning with the conversion of small 100 square meters of SWRT improved soil water holding capacity, which cost smallholder farmers a few US dollars and expanding these SWRT Solutions onto larger farms, then a few years of two to three cropping seasons annually could enable many African countries to become grain exporters. This revolutionary idea is highly achievable by combining improved irrigation water use efficiency with maximum retention of irrigation water and nutrients in plant root zones. More attention, time, labor and funding are needed to bring this blue-green food production revolution to Africa. We have the knowledge, experience and local anticipation multitudes of younger farmers across Africa who are awaiting revolutionary long-term SWRT solutions that convert their lands into profitable productive landscapes. Alvin Smucker, Director of MSU SWRT Solutions for Africa and beyond.